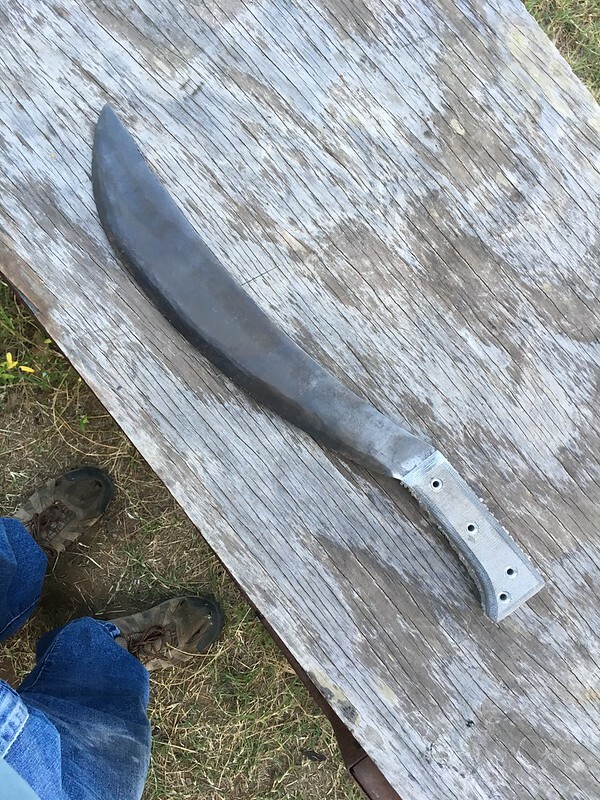 I don't often work on blades that I didn't make myself. However, I agreed to do a re-handle/re-sharpen job on a Collins engineer bolo mostly because I wanted to get to check it out first-hand. I took waaaaay to long to do the job, though the work itself went fairly quickly. I had thought that these were WWII-era, and have found since then that they started making them pre-WWI. The bolo wasn't in terrible shape, but definitely wasn't pristine. The owner picked it up for $25. 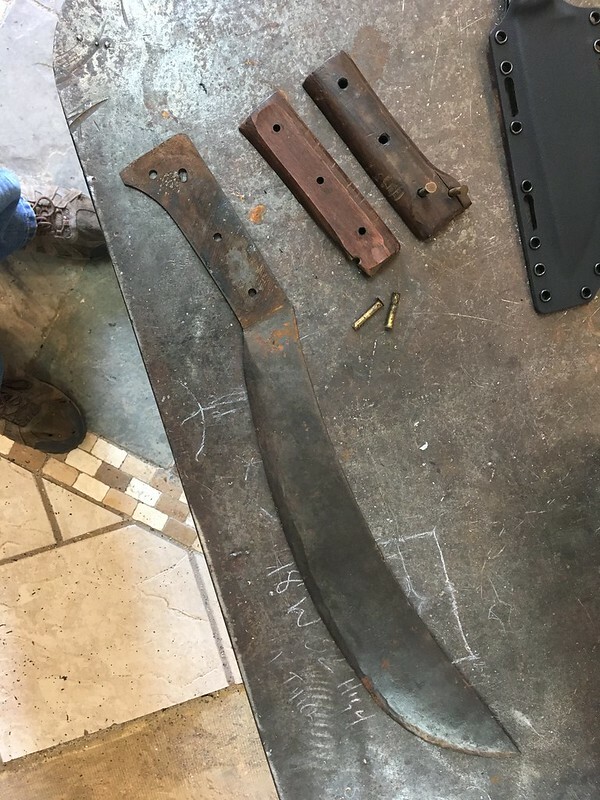 It had cracked handle slabs and was missing a chunk from one, and there were some pretty deep notches out of the ax-like edge. It looked like re-sharpening had altered the profile a bit. I started out by grinding the heads off of one side of the brass handle rivets and removing the slabs. There was no glue/epoxy/cutler's resin. The handle wood was untouched by rot, though cracked from impacts. I think it is probably rosewood. I drilled out the rivet holes from 3/16" (I think, didn't actually measure) to fit the 1/4" stainless tubing I was using on the replacement. The third hole was double-drilled, apparently at the factory, which made getting it sized a bit tricky as it kept catching the drill bit. Then I built a jig from poplar wood, cut out slabs from TeroTuf, attached them to the jig, and shaped them with a series of router bits. I then cut out the 1/4" stainless steel tube rivets. Due to the tapered tang, I ended up needing to cut them different lengths. The original slabs were the same thickness throughout, so I didn't try to taper the replacement slabs. 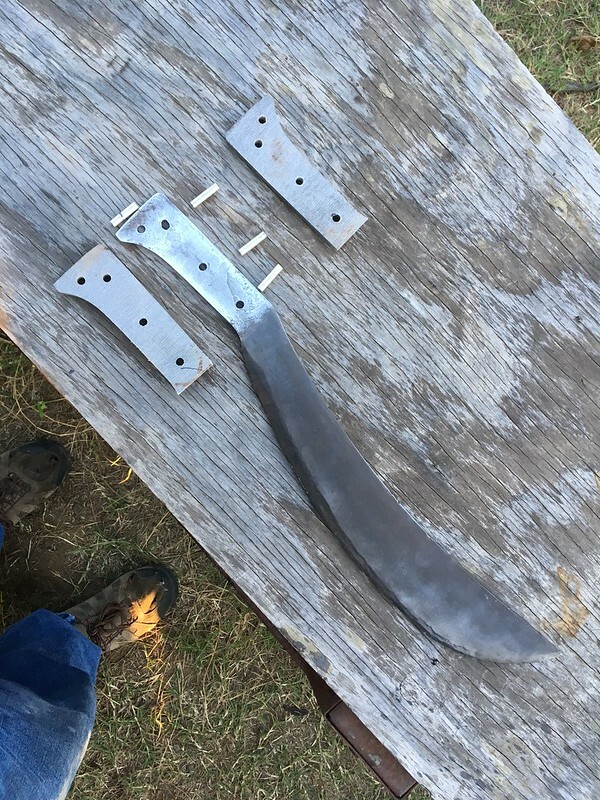 I cleaned up rust with a wire brush on a bench grinder on the blade and a ScotchBrite belt on the tang, then attached the new handle slabs with rivets and epoxy. Then on to working the edge. 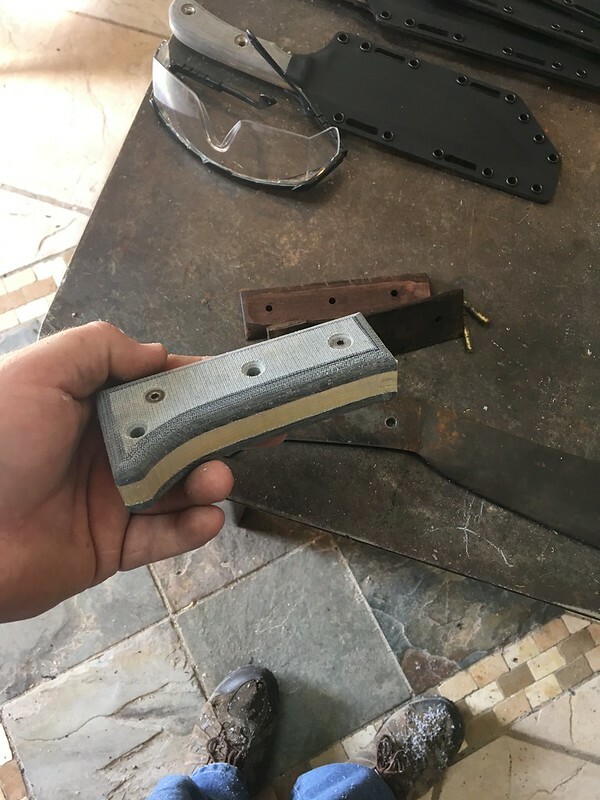 I had not intended to try to get all of the notches out, but by the time I had the bevel cleaned up, most of them were gone. This thing is truly frightening now. 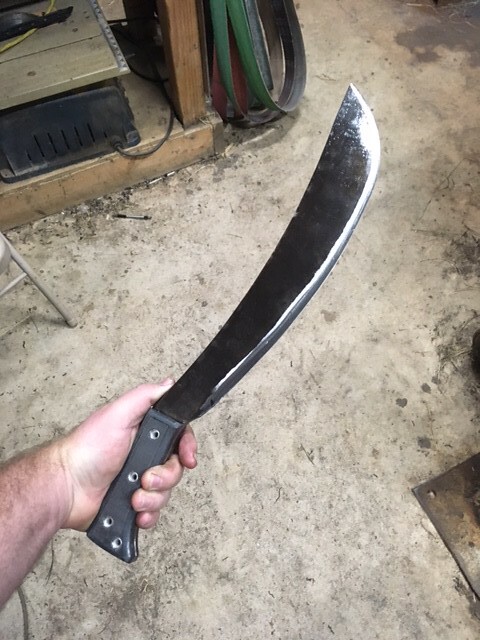 It's a massive blade, with a convex edge that will scare the hair off my arm. The owner is going to have to make sure he hits what he's wanting to, because it will tear up Jake on anything it contacts. Should be good for another century of work now. Awesome work, even if you didn't start the project yourself. 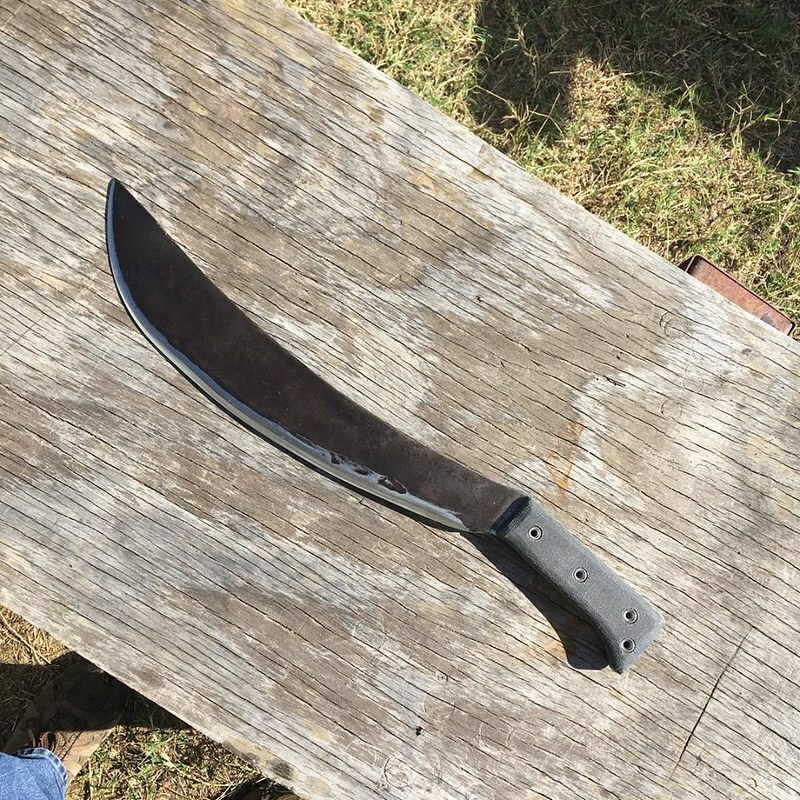 I wasn't familiar with this blade at all until reading this. A little bit of quick googling tells me that $25 was a really good price and also that I need to have one now. Very nice work, and the $25 reminds people there are deals to be found. 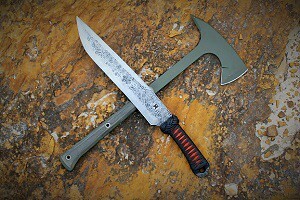 Ever see one of the USMC Entrenching Machetes Collins & Co made?